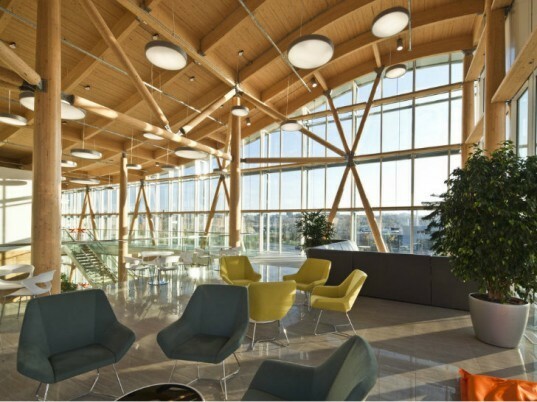 Biotechnology firm GlaxoSmithKline's new headquarters in Quebec is impressive for reasons beyond its super streamlined architecture. The innovative structure was designed to achieve LEED Gold certification and make the working lives of its employees more enjoyable. Conceived by CoArchitecture, the GlaxoSmithKline Admin building features a FSC-certified timber frame, geothermal heating and cooling, and a south-facing atrium with a double-skinned facade. Orientated to the east and west with a long glass-fronted facade to the south, the GlaxoSmithKline Admin building literally soaks up the sun. A double-skinned envelope works with natural ventilation to minimize overheating and ensure a comfortable indoor climate. Translucent metal panels on the east and west sides reduce glare from the morning and evening sun. By contrast, the north side works to minimize heat loss with less windows and more insulation. The overall effect provides considerable daylight that invigorates the work space. The main work areas are placed on the north side where there is more indirect sunlight, and the south side features interactive spaces for socializing and meetings. The existing site was practically void of vegetation and had poor soil quality, so part of the project also included revitalizing the landscape. Native plants were installed to promote biodiversity, replenish the groundwater and create scenic views from inside. Built with FSC-certified wood, the organic structure is warm and inviting. An innovative geothermal system provides heat and cooling when needed. Radiant floors circulate warm water to provide heat, and a coolant flows through chilled beams to reduce the temperature when it is too warm. To Coarchitecture’s knowledge this is the only geothermal system like this in Quebec. The overall goal of the project was to reduce its impact on the environment while increasing creativity and productivity. Orientated to the east and west with a long glass-fronted facade to the south, the GlaxoSmithKline Admin building literally soaks up the sun. A double-skinned envelope works with natural ventilation to minimize overheating and ensure a comfortable indoor climate. Translucent metal panels on the east and west sides reduce glare from the morning and evening sun. By contrast, the north side works to minimize heat loss with less windows and more insulation. The overall effect provides considerable daylight that invigorates the work space. The main work areas are placed on the north side where there is more indirect sunlight, and the south side features interactive spaces for socializing and meetings. The existing site was practically void of vegetation and had poor soil quality, so part of the project also included revitalizing the landscape. Native plants were installed to promote biodiversity, replenish the groundwater and create scenic views from inside. Built with FSC-certified wood, the organic structure is warm and inviting. An innovative geothermal system provides heat and cooling when needed. Sustainable strategies in the Summer.